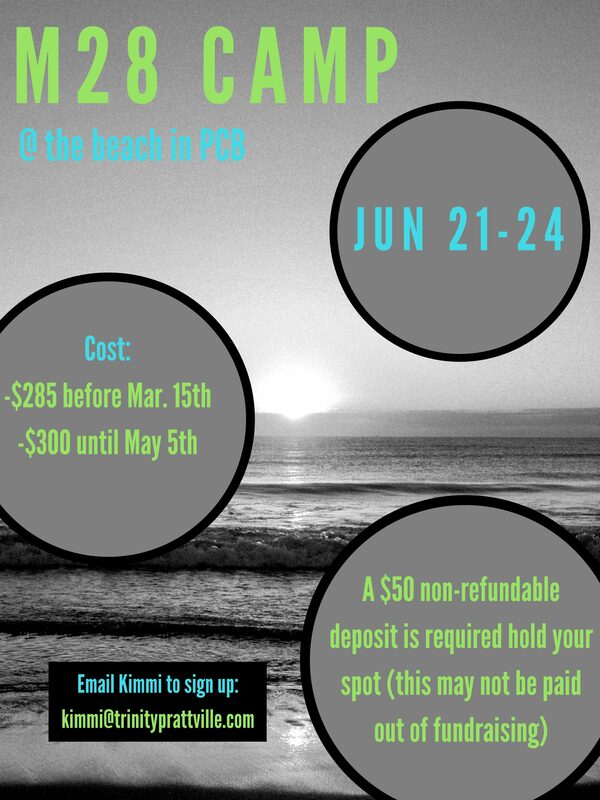 This summer we have the awesome opportunity to attend M28 Camp again, but this year it will be at the BEACH! We will be staying at Laguna Beach Retreat Center in Panama City Beach. M28 Camp is an awesome retreat full of worship, learning, and adventure. We will spend time in big group worship, small group breakouts, and soaking up sun at the beach as a youth group. We have seen so many life changing moments come from this retreat, and really believe in the things God is doing through the group leading the retreat. The cost of this trip is $285 before March 15th, and $300 before May 5th. Please note. $50 non-refundable deposit is required to hold your spot, and your remaining balance is due before we leave. This deposit may not be paid of our fundraiser money, but the rest of the trip can be.